When the announcement finally came, I jumped on top of the early registration discount, booked my flight (yay miles! ), reserved my hotel room, and began the count-down to August in Los Angeles. I was ecstatic to be an attendee, however, a huge part of me felt like an imposter. BlogHer is a huge conference, and it isn’t cheap, which is why, at least to me it seemed, a large number of attendees had huge numbers in terms of pageviews, followers, likes, etc. In other words, these were “the big dogs.” I had nowhere near those numbers when I registered (still don’t), and I still considered my blog to be more creative outlet than serious business. I worried I wouldn’t fit in with these phenoms of Facebook, these titans of Twitter, these badasses of bloggery. My concerns were somewhat assuaged by my familiarity with several women in attendance. I am a proud member of several blogging/writers’ groups on Facebook, and am happy to call many of them “friend,” even if it’s only in the virtual sense. Jacqui Zadak, AKA MrsMuffinTop, AKA “Today Show” contributor, AKA, all-around awesome person, and L.A. resident, is one such person, and, lucky for me, she was going to BlogHer. I am so thankful, I reached out to Jacqui before the show. Although, I am a friendly person, events of this magnitude are intimidating for first-timers, and having someone to help you navigate the landscape is beneficial. I guess you can call them your conference sherpas. Jacqui was kind enough to meet me the evening I arrived, and together we explored the EXPO floor. In between chatting with brands like “Melissa and Doug,” “Lansinoh,” and “Adam & Eve,” we encountered other attendees, many of whom Jacqui already knew and were kind enough to introduce themselves. I felt less intimidated as the show progressed, and realized most of the attendees were there for the same reasons: to learn, to network and to have fun. I enjoyed meeting other attendees so much that I ended up spending more time chatting with my new connections than in the breakout sessions or meeting with brands at the EXPO. Was that my intention? No. 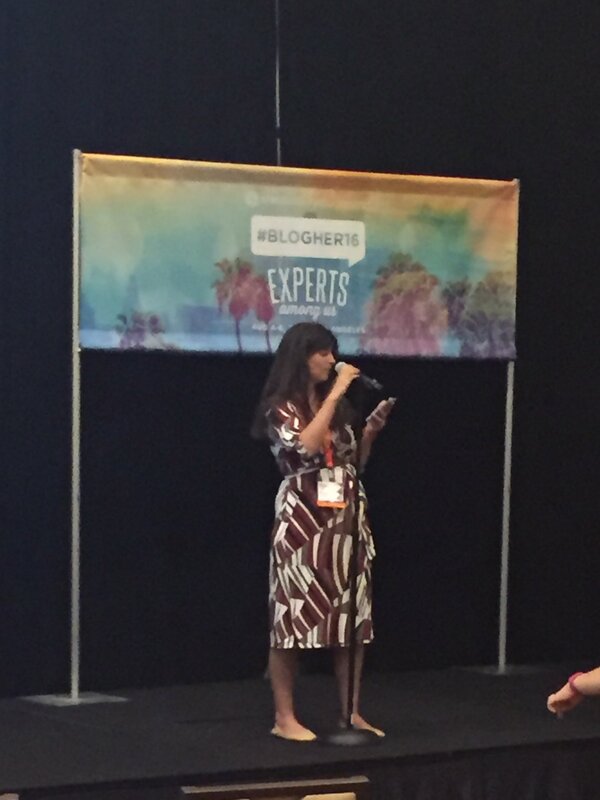 I had my BlogHer schedule stuffed with various programs I hoped to attend and brands I wanted to meet. I was a woman with a plan, and I was going to stick with it. I underestimated how much value there was in conversation. I found myself in stumbling upon so many in depth talks with my fellow attendees. Whether it was sharing the details of our own blogs/brands or discussing our thoughts on Kim Kardashian, it was easy to caught up in the conversation and forget how much time had passed. I believe these impromptu meet-ups are what encouraged me to read one of my blog posts aloud at the Listen To Your Mother Open Mic event. I knew my nerves would be eased by the warmth and support in that hotel meeting room. I was greeted with positivity and love, something any blogger knows is often hard to find in the virtual world. I am so glad I shared my voice and listened to many more. I do somewhat regret not sitting in on some of the sessions, from what I hear, they sound extremely informative. 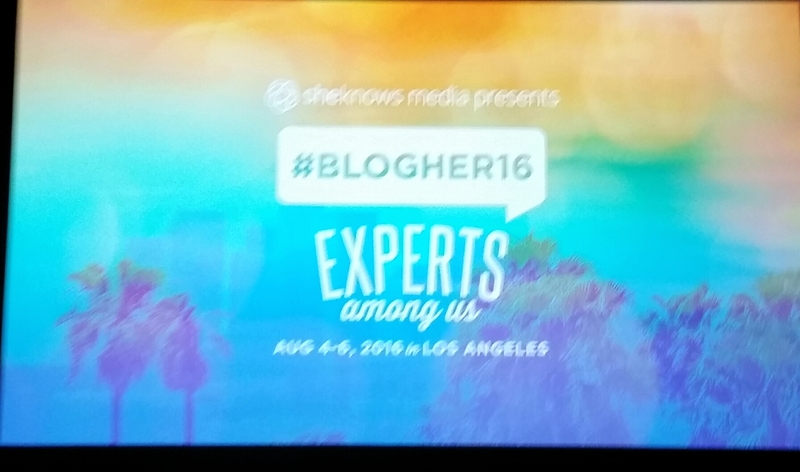 (Thankfully, this was a blogging conference and recaps aren’t hard to find.) However, I would not trade in those in-person connections forged in hotel hallways and after lunch-time lectures. At best, I gained some some lifelong friendships, at worse I grew my network and discovered some fantastic blogs. Those in sales are fond of quoting the famous “Glengarry Glen Ross” speech for success: “ABCs: Always Be Closing.” I prefer something a bit more meaningful. Always Be Connecting. You never know where it may lead. I remember your piece at the Open Mic event! So glad you read it to all of us!